In other ways, it is difficult to remember a time when women weren’t ordained. But I remember that time. 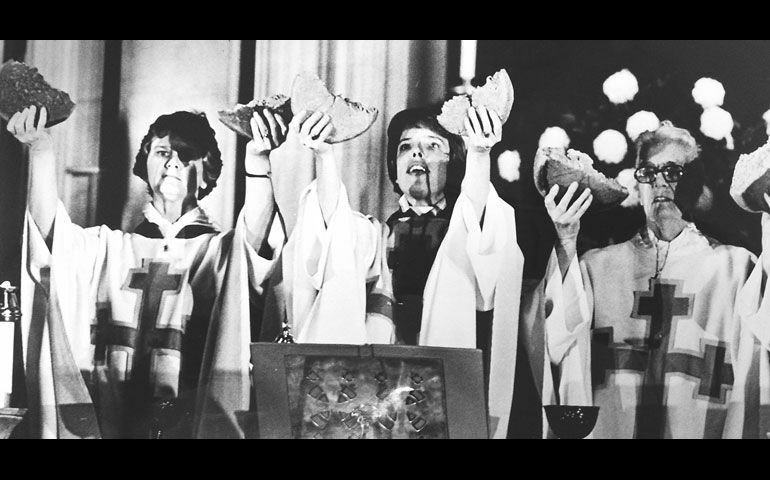 Indeed I lived through the tumultuous years leading up to the ordination of eleven women in Philadelphia in 1974. I was ordained a priest in 1971 in my sixth month as the curate at St. Martin’s Church, Charlotte, North Carolina. St. Martins’ was the home parish of Carter Heyward, an exact contemporary of mine. Carter at that time was at student at Union Seminary in New York City and was in the forefront of women pushing the Church to ordain women to the priesthood. 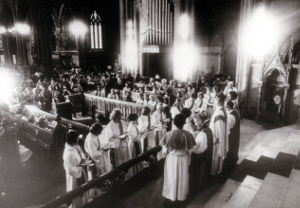 I myself had only recently come into the Church and like many converts, I espoused Episcopal traditions with gusto. One of those traditions happened to be an all-male priesthood. I don’t know that I was solidly against the ordination of women, but I certainly was no enthusiast for it. One Sunday in early July, 1974, I preached a sermon on the gospel story of Jesus sending out his disciples two by two to places where he himself was going to come. I entitled it “Disciples That Go Ahead of the Master.” I preached this sermon never even thinking about or mentioning the hot-button issue of women’s ordination. Carter’s mother, Mary Ann, was in church that Sunday, as she usually was. Ever the enthusiast for “the women,” as she put it, she immediately inferred that the sermon was precisely relevant to women’s ordination. She asked for a copy of it. News came out in several weeks that eleven women had been ordained to the priesthood in Philadelphia by three bishops. One of those women was Katrina Swanson, who co-authored the liturgy we are using today. Another was Carter Heyward. Mary Ann Heyward sent copies of my sermon to all eleven of those women. Within days, I think, each one of them wrote me a personal note thanking me for my support. And that is how I became an advocate for women’s ordination. A year later, four more women were ordained in the Diocese of Washington in St. Stephen and the Incarnation Parish, known for its highly experimental liturgies, its unorthodox practices, its hit-the-streets-and-demonstrate-for-justice-and-peace mentality, and especially for its popular rector, The Rev. William Wendt. Father Wendt got into trouble with his bishop, The Right Reverend William Creighton, and was brought up on charges for which he was tried in a church court and ultimately reprimanded in the cathedral for his disobedience. I never imagined in 1975 that I would one day serve the parish of St. Stephen and the Incarnation. 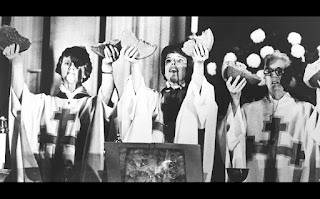 In 2015, I was in my twelfth year as Senior Priest there when we celebrated the fortieth anniversary of the ordination of the Washington Four. The three living priests who had been irregularly ordained returned for a special liturgy and celebration. The wonderful occasion brought together a host of people who had been directly affected in one way or another by that event in 1975 that had been so painful. The year before, Carter Heyward had come to St. Stephen and the Incarnation to preach when we commemorated the fortieth anniversary of the Philadelphia ordination. It was all a part of a year of commemoration and celebration that left me grateful that I had lived through the struggle, but profoundly aware that I myself had been privileged to avoid any suffering of my own, and that for only one reason: I was male. It is interesting to me that the first lesson chosen for this liturgy is the story of Abraham’s agony over not having an heir. It is a story about trust, the theme of the entire Abrahamic cycle. Trust is integral to faith. But there is a sub-text to the story. 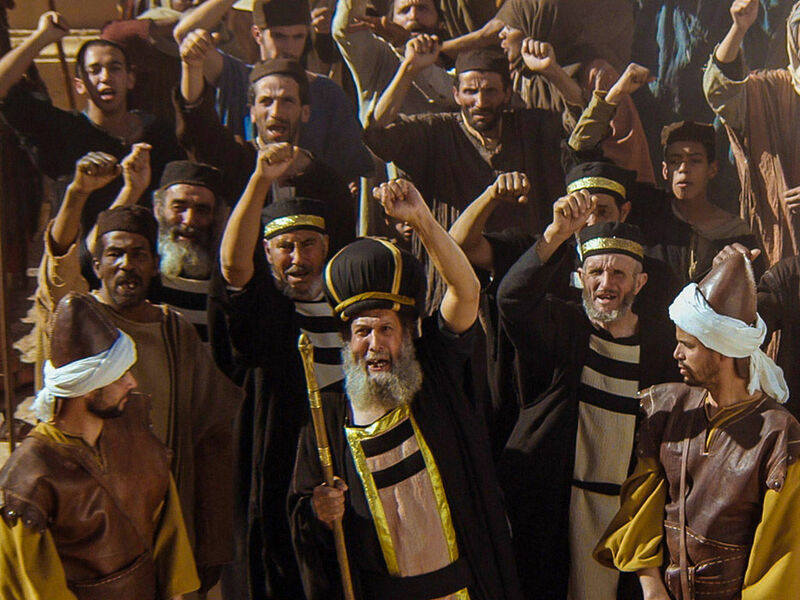 It is implicitly about an outsider, Eliezer of Damascus, Abraham’s slave who he thinks will be his only heir. Eliezer is only mentioned in the biblical text in this connection, although there are rabbinical stories about him. So in the background of this highly important story about the establishment of a lineage that was ultimately to become Israel, God’s own people, who in turn were to be a light that shown for all nations, there hangs the question about who along the way is left out. 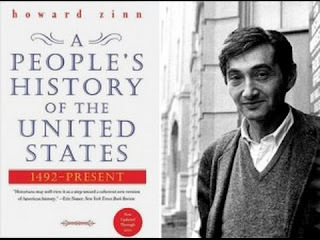 Several years ago a friend of mine introduced me to Howard Zinn’s A People’s History of the United States. 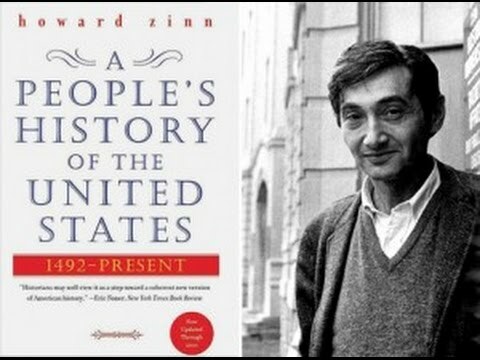 Howard Zinn was a professor at Columbia University. 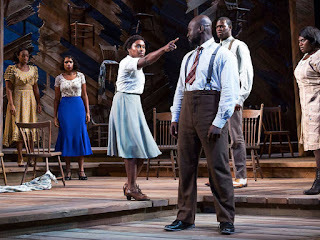 His history is history told from the underside, stories of the people who were the losers, like the Native Americans, like Africans forced into slavery, like common laborers of all races that rioted and frequently died for worker’s rights, like children who were working in factories under awful conditions prior to the passage of child labor laws. I was amazed on page after page to learn of things no one ever taught me in school. Nearly always the winners write the histories. They tell their own story about how they are powerful. They crow about what they’ve accomplished. Only recently have we begun to pay attention to the unsung heroes that have come from the ranks of minorities. And there are plenty of people who don’t like telling the stories of the so-called “losers” one bit. and have come to the help of your servant Israel. Mary herself, a woman, or, more likely a teenage girl, is the poster child for the powerless. She is female in a world dominated by men, young in a culture where age is revered and children discounted or ignored, a Jew without vote or office in a nation subjugated to a foreign imperial authority. It is not an accident that this all transpires on Easter Day. Sitting around the table is the whole cast of characters, all of whom, to a person, are walking in darkness and the shadow of death. That is the case with all human beings at one time or another. 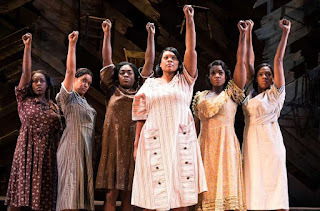 But even the most bedraggled of them sees and hears Celie claiming her power and proclaiming her freedom, and some, notably the women, take fresh courage. One laughs declaring she is home again, back where she once belonged and was brave. 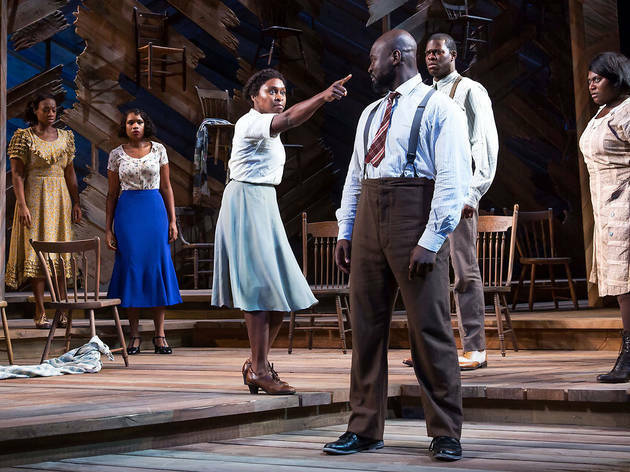 Another follows Celie’s example and declares that she too is leaving, leaving her narrow immature dependency to become the singer she believes she can be. That’s Easter. That’s resurrection. That is the story of the power of God that we know as Christ breaking the bonds of death and hell and rising victorious from the grave. It happens again and again and again in lives like Katrina Welles Swanson’s and Carter Heyward’s. In lives like Bill Wendt’s. In lives like yours and mine. And it will happen again in this nation of ours. Evil will prosper but for so long, but the cause of Truth will triumph. It is built into the fabric of the universe. And that fabric may be ripped and torn and trampled upon by the forces of darkness and destruction and death, but that fabric will be mended by the only force that ultimately breathes, namely Life itself. Truth and life and love will continue moving, however unsteadily and haltingly, until the circle of life becomes wider and wider to include everyone. The only ones excluded are the ones who exclude themselves. The mighty are cast down from their thrones not by some punishing god from a distant throne but by self-will dedicated to the self’s destruction. The rich are sent away empty not by the Spirit but by their own choice to refuse the Bread of Life, which is Truth and Justice, Mercy and Love. We have seen darker times and lived through scarier moments, many of us. And we may be poor, we may be black—or white, we may be ugly—or beautiful, but by God, we’re here, we’re here. A sermon preached on the commemoration of the ordination of women in the Anglican Communion on the texts Genesis 15:1-6 and Luke Luke 1:46-55. If you were listening to the gospel at all today, chances are that is one sentence that did not exactly leap out at you. It seems off-topic, ill fitting in the rich discourse about Jesus being the Bread of Life. We are loaded with preconceptions about the eucharist and notions of eternal life as a future heavenly existence. About the last thing we are primed to pay any attention to is this rather obscure quotation from Isaiah. And yet here in the midst of a critical discourse is a thought that might possibly change the way we think. It might rearrange the way we hear the whole story. It might even change our lives. Many years ago when I was a young curate in my first parish we invited Sister Ellen Stephen of the Order of St. Helena to come as a weekend guest. My wife and I had the honor of hosting her. At the time, I was doing my best to start a practice of daily prayer and meditation. In fact, since high school I had in some ways been preoccupied with prayer, trying to understand the logic of it (as if prayer were a thing to be understood logically!). I took the opportunity of opening a conversation with Sister about prayer. Her first words to me were, “Prayer is a love relationship with God.” I had little idea in 1971 that I had just heard words that I would not only remember as long as I had a mind, but words that would come to take on greater and greater significance as years rolled on. What I’ve come to see in the intervening half century is that prayer is everything, that God is everywhere in every thing, and that the entire experience of being in this universe is about nothing else but being swept up in a continuing love affair with the Essence of Life itself, one name for which is God and another name for which is Love. To jump to the chase: that, I do believe deeply, is what all the words about “Bread of Life” are about. In all these discourses in the Fourth Gospel, Jesus is quite insistent that what is at stake in his life and message is nothing less than the meaning—one might say the secret—of life itself. It is about how to live. It is positively not about how to succeed. It is not about how to adapt or necessarily about how to be happy the way we normally understand happiness. Jesus’ life and message are about the core reality of the universe. Indeed he identifies himself in the Fourth Gospel with the Creator of the Universe whom he consistently calls his father. He is equally clear that the relationship he has is by no means something he wishes to hoard. He clearly wants to impart whatever he has to a community which itself is to be the prototype of a new humanity. His is life lived in right relationship with his Abba, the origin of all. We get him. We know what he is talking about even though we have sense enough to know that we don’t understand it fully nor ever will. Now if you read the entirety of Chapter 6, for that matter the entire sweep of John’s gospel, you’ll quickly see how it is that people, including oftimes his disciples, don’t get it or don’t get it fully, and it is pretty obvious why. Their own preconceptions get in the way. That is exactly what happens to people today, including you and me. We want to be religious, sure. We want to be spiritual. And we think that the way to do it is to figure out how to squeeze it into categories that we already believe to be satisfactory, indeed true. So, for example, take the average American. He or she is schooled to think that our capitalistic economy is the sine qua non, the apex of modern life. We’ll defend it tooth and nail. We’re generally speaking not about to give that up for Jesus. No, we take Jesus and make out as if he himself is a capitalist or at least approves of those who are. He talked more about money than any other single subject and most of what he said flies in the face of capitalist economic theory. We take his radical sayings such as “Go, sell what you have and give to the poor and come follow me,” and let all the air out of them telling ourselves that he is not to be taken literally. We read with great solemnity passages from the gospels, sometimes even reverencing them in clouds of incense and intoning them as if they were our most deeply held opinions, such as “Love your enemies,” without thinking that those words call into question the billions of dollars that we collectively put into what is in effect a war machine, ready to spring into action at the drop of a hat. We have whole myths about national security that we imagine Jesus approves of. There is not a shred of evidence that Jesus ever bedded down with any political regime. It seems to have escaped our notice that Jesus took on both the political establishment and their religious toadies in behalf of the poor, the oppressed, the marginalized, the outcasts. We even imagine that those who shouted “Crucify him” were a fickle crowd that had so recently hailed him as Messiah with palm branches and hosannas rather than a religious establishment sick of and frightened by his habit of undercutting their prestige and influence. "Crucify him," was the cry of the establishment. Little wonder that the crowd hearing him murmured and complained about his words. He didn’t fit their paradigms. His message ran counter to what they held dear. Unless and until we can tune in to what it is that God—the Truth—is teaching us, we will never hear the voice of the Shepherd. We will never be able to eat the bread of life, because our mouths and bellies will already be full of the bread that perishes. I hasten to say that our obstinacy and in some cases dull mindedness don’t cause God to stop loving us. Or to put it another way, we can go right along doing quite fine without paying any attention to the Wisdom, the Bread, that Jesus both is and is offering. As Rabbi Adin Steinsaltz puts it, “When God says, ‘I yearn for you,’ I may think, ‘Leave me alone. Mind your own business.’ Some people will answer like this. And for others it’s a very compelling power.’” You may curse the sun, but it keeps on shining. Or the wind and it blows wherever it will. Or your Creator whose very presence is stamped on your every cell and in every crevice of your body, and the Love force that enlivens you will still beat with every thump of your heart. And, just for the record, it doesn’t matter a whit whether you believe any of this or not. It just is. The issue, however, is how do we open ourselves to this secret, this dazzling Kingdom into which we’re invited, this great banquet prepared for us, this priceless pearl of wisdom? For most of us it starts with clearing away some of the clutter that we’ve collected over the years. Clutter such as the notion that God is somehow distant—up there or back in history or remote. Clutter like the unhelpful notion that eternal life is somehow in the future and amounts to infinite time rather than a different dimension that is present here and now and therefore a life to be lived, not awaited. Clutter like the point of Jesus is to get the good boys and girls into heaven and make sure that the bad boys and girls go to hell. Clutter like the singularly inadequate notion that the entire project of religion is being nice. Those things get in the way of the truth, because none of that clutter is worth a cent, no matter how much we might prize it. This process of what we might call spiritual housecleaning is not a once-and-for-all operation. It goes on continually, just as growth does. It’s best to realize at the start that the Bread of Life is related to hunger. When we are hungry, really hungry, we generally settle for the nearest food available, not necessarily the healthiest. So we will continue to collect clutter and thus we’ll continue to need to downsize. What all this is about, of course, harks back three chapters to Jesus’ famous encounter with Nicodemus. In that nocturnal interview Jesus tells Nicodemus, who held all the credentials of a wise person and teacher, that he, like everyone had to start over. Be born anew, be “begotten from above,” Jesus tells him. You simply can’t shake a little religious seasoning over whatever it is you already have on your plate and call it a day. Nothing will do but learning how to live differently. The analogue to this idea appears in the other three gospels in the most radical statement that Jesus ever made: “Except you become as children, you will never enter the kingdom.” He is not talking about some romantic fluff about children being innocent; he is talking about children because they are newly minted, and, at least in the beginning, uncontaminated by the clutter that society crams into us largely to get us to conform to the existing norms. That is what socialization is fundamentally for. This of course is only the beginning. Start dancing with Jesus and you’re in for a spin that will take you into places you really can’t imagine. And if you’re already engaged in this dance you will doubtless bear me witness that, yes, about the time you think you’ve arrived at enlightenment, you will see some old shadow drifting in from who knows where that will need to be welcomed, affirmed, included in your nice new interior castle that you were sure was finally in order. Surprises abound. 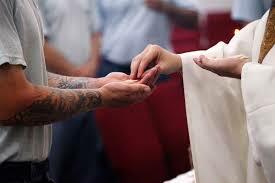 Remember that when you stretch out your hands today to receive the Bread of Life. Remember that the Bread of Life appears as one thing but is often something far beyond appearances. Remember that you have no wisdom, only smarts and maybe an admirably high IQ. Remember how you were when you were little—open, believing, and generally pushing limits and getting into trouble. but is often something far beyond appearances. Life is a love relationship with God. At the end of the day love alone suffices and satisfies. The Bread of Life personified in Jesus promises that it is true: they, including you and me, will all be taught by God. A sermon for The Twelfth Sunday after Pentecost, Proper 14B, on the text of John 6:1, 41-51. © Frank Gasque Dunn, 2018. John 6:45; a reference to Isaiah 54:13; cf. Joel 2:28-29. Adin Steinsaltz, “Educating Desire,” Parabola, vol. 31, no. 2 Summer 2006 (New York: Society for the Study of Myth and Tradition, 2006), 62.